Congratulations! You’ve made a difficult decision and chosen the size, shape, and type of sink that suits your needs and your specific kitchen. Hard part’s over, right? Well, almost. Now you need to pick a sink material. It’s not quite as complicated as choosing the type of sink (so you can breathe a sigh of relief – at least you got that over with! ), but it may be even more important. Kitchen sinks are now available in more materials than ever, which is great for you – more customizability! – but makes your choice a bit more difficult. 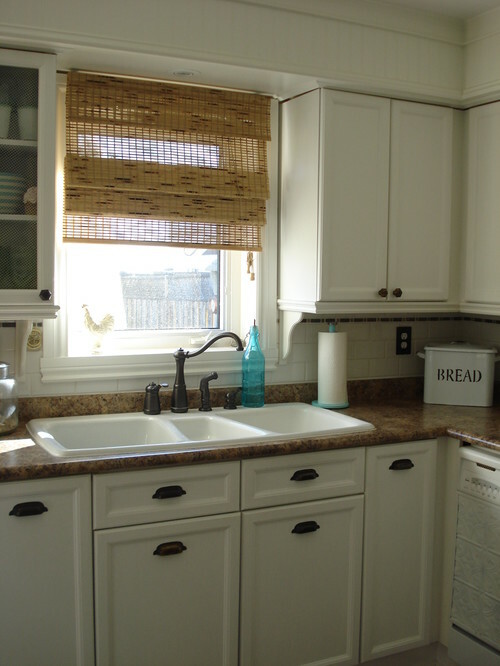 Read on for Part II of choosing the right sink for you and your kitchen: sink materials. If you have an old-school kitchen, it likely features an enamel-coated porcelain or cast-iron sink. While they are stain-resistant, classic, glossy, and available in many colors, these sinks chip, scratch, and crack easily, exposing the black iron base and generally looking neglected. If you go for an enamel sink, beware of colors that will go out of style; choose a neutral color so that you don’t regret that pink or yellow sink one day. Cast-iron and porcelain sinks are often heavy and bulky, so consider your cabinetry and installation capabilities. One more consideration: many enamel sinks cannot be undermounted, though they are available in apron-front. If you want a white or neutral sink or a farmhouse look, fireclay is the way to go. It’s durable and strong and will probably outlast most of your other kitchen fixtures. Like enamel, fireclay is heavy and complicated to install; most fireclay sinks are expensive as well. For more details on fireclay, click here. 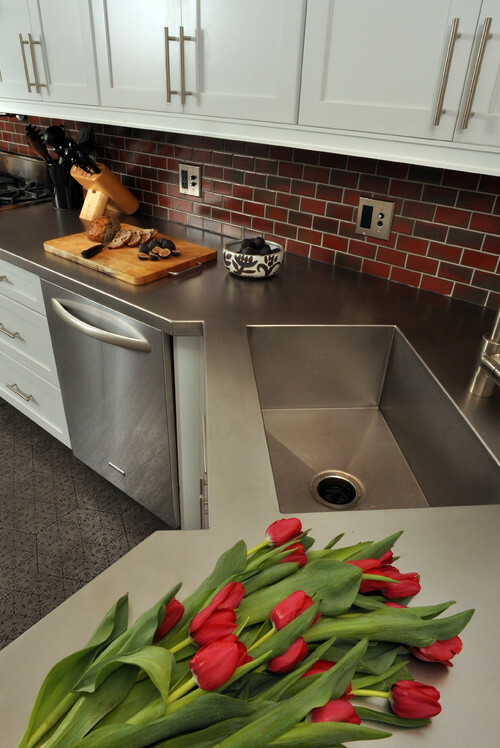 The majority of sink purchasers opt for stainless steel. It’s professional, budget-friendly, easy to install, and complements virtually all kitchen colors, especially those with stainless steel appliances. Stainless sinks are heat- and stain-resistant, will not chip or crack, and are available in the widest variety of shapes, sizes, types, and mounts. Consumer Reports has found that gauge is not a significant indicator of quality (though higher-gauge sinks are less likely to dent) but that sinks with sound-absorbing pads to reduce the noise that’s commonly associated with stainless sinks. Stainless steel does scratch and may show water marks; select a brushed or satin finish rather than the shiny mirror finish to hide scratches. Polyester and acrylic sinks – usually cast-iron or fireclay look-alikes – are made of fiberglass and plastic, making them the least expensive options. Their low cost, shininess, and variety of color options make them an acceptable choice, but be warned that these sinks, due to their soft composition, are not stain- or damage-resistant and will likely need frequent replacement. If you need a usable sink until you can afford a better one or like to change the look of your kitchen on a regular basis, acrylic may be a good choice. 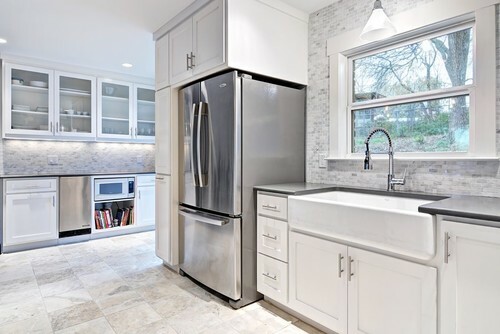 While glass may seem like a terrible choice for a kitchen sink, homeowners are choosing it. Treated glass holds up well against heat and chemicals, but can shatter when heavy or sharp objects are dropped onto it. Consider a glass sink as a bar or hand-washing sink for decorative purposes; they’re beautiful and available in many unique colors and designs, but are not the best option for regular or heavy-duty kitchen use. A copper sink may seem to be like glass: pretty to look at, decorative, but not all that practical. Think again! Copper and brass sinks are becoming more popular due to their rust resistance and anti-microbial qualities. Handcrafted copper sinks are different and charming, but they are functional as well; easy to clean (just follow the manufacturer’s instructions; don’t use harsh chemicals on copper), tarnish-proof, and high-quality. Choose a high-content copper sink to beautifully match a natural-material kitchen. Stone sinks – granite composite, quartz composite, marble, natural stone – are stylish in today’s kitchens, and for good reason. A stone sink lends a natural feel to a kitchen and is generally extremely durable due to its nonporous and antibacterial composition. Darker colors will not show dirt or water marks (though dark and solid quartz will show scratches more than light quartz); a patterned stone conceals scratches. Stone must be handled with care during shipping and installation or it may crack, but high-content granite composite is one of the most stain-, heat- and damage-resistant materials available. Before choosing natural stone, question its durability. Softer stone will damage more easily, and some types are more susceptible to stains. Two drawbacks of a stone sink: 1. it lacks the shiny surface of fireclay, enamel, or stainless and 2. it can be pricey! 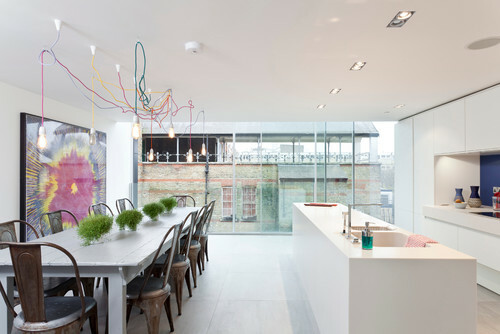 For an ultimately seamless kitchen, choose a solid surface sink. 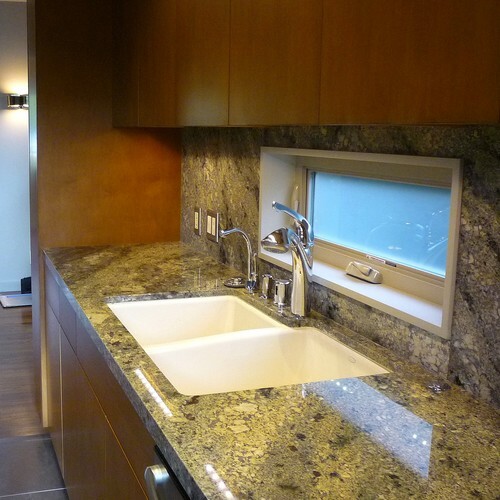 These sinks are made of the same material as your countertops and built in for a smooth, streamlined appearance. 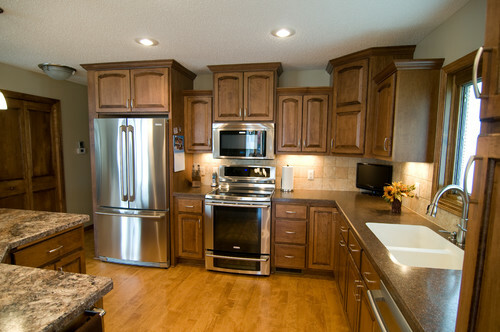 Solid surface can be quartz, granite, stone, stainless – virtually any counter material. Test out the material first to ensure that you’ll be happy with it and that it will hold up well, because you will be stuck with it! It can be expensive to install but if you want a minimalist or monochromatic kitchen (and can afford it), it’s your best choice. You’re almost done with choosing your kitchen sink! Check back in next week for Part III – faucets and accessories – to complete your purchase.